Some early consoles like the NES and the Sega Master had a horizontal screen resolution of 256. That sounds good for an 8-bit machine, until you consider that a sprite sometimes needs a slightly negative position in order to be partly off the left side of the screen. (Consider e.g. 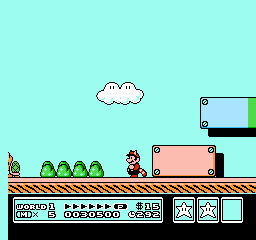 the bad guys in Super Mario Bros, who move onto the screen from the right, and if you and they miss each other, end up moving off the screen to the left.) The upshot is that you need to track an extra bit for sprite positions. Not a huge problem, but it's got to be annoying being so close to being able to track positions in one byte, and just missing the mark. It would seem that by reducing the resolution to 248, you could represent positions in one byte, without making any discernible change in the quality of the display. Why didn't they do this? However, the NES did actually provide the feature you're suggesting, in a way: bits 1 and 2 of the PPUMASK register can be used to keep the leftmost 8 pixels of the screen blank. This not only allows sprites on the left side to be hidden, but also helps to reduce the mirroring glitches on the sides of the screen in some games. 256 is the maximum number of pixels per row, but most games used fewer. Using fewer pixels allowed for partially off-screen sprites with only 8 bits of position information. Most hardware of that era allowed some flexibility with screen resolutions. While the timing for the display (PAL or NTSC) was fairly well nailed down, the programmer could choose to start or end the actual display of pixels earlier or later on each scanline, and earlier or later in the vertical refresh cycle. the stuff you are describing has nothing to do with x resolution selection. In the 8 bit era CPUs didn't have mul , div instructions so computing *,/ was really expensive. That is why the x resolution is usually power of 2.
and even the bit-shift can be replaced by adding/oring with higher BYTE instead. Now back to your problem. Handling 16 bit x position is much faster than handling non power of two x resolution screen rendering. As you manipulate the x,y few times per frame but rendering sprites wold require expensive computations on per scan line of each sprite. Not the answer you're looking for? Browse other questions tagged graphics nes sprite sega or ask your own question.